For the past couple of weeks we have been talking deep conditioning. 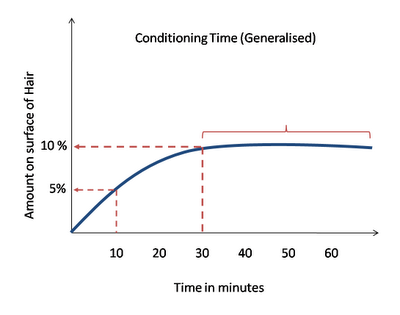 Today is the turn of two factors that are really key namely temperature (should you use heat when conditioning?) and time (should you leave a conditioner on for hours?). Now for the purpose of this post, I will again define a conditioner as a water based conditioner (deep, intensive, mask or rinse out). If you are using oil, this is completely different and its own rules apply. Increased time and temperature do increase the amount of conditioner adsorbed to the surface of hair. The maximum time is 20-30 minutes and the maximum temperature is around 35°C. I am being very general in this post because the fact is that every single ingredient that can adsorb and/or penetrate into hair (e.g surfactant or protein) actually has its own unique behaviour when added to a conditioner. This is also affected by other ingredients in the conditioner. However there are common similarities in behaviour and these are the ones I wish to emphasise. 1. Increasing the time you leave conditioner on hair allows more of it to adsorb with a maximum adsorption at 20- 30 minutes. The key ingredients that can stick to hair (surfactants, hydrolysed protein, silicones, polyquats etc) will do so within seconds of applying the conditioner. If left on hair for longer, the amount will in general double within 10 minutes. If left on for another 10-20 minutes, the amount will increase by another 60-100% of the mark set at 10 minutes. However after 30 minutes from initial application, there are no more increases in conditioner adsorbing to hair. The reason for this is that the hair conditioner simply has no more places on the hair where it can stick to.......all gaps which it can plug and all surfaces where it can attach are occupied. If you look at the 10 minute mark, you can see about 5% is on hair and at the 30 minute mark this increases to 10%. However at 40, 50 or 60 minutes there is no further increase, it just stays at 10%. Please do note that the numbers 5% and 10% are NOT real measurements. Adsorption is usually much lower than this (even as low as 0.01%) but for ease of digesting the information I picked simpler numbers like 5 and 10. 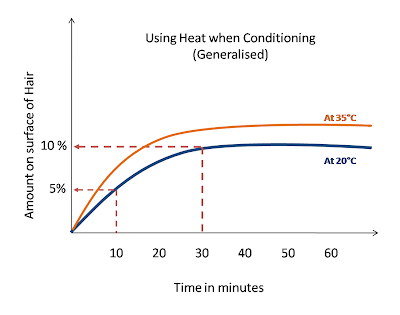 There are two main lines in the graph one in blue at 20°C and another in orange at 35°C. What you see is that the orange line is shifted just slightly about the blue one. 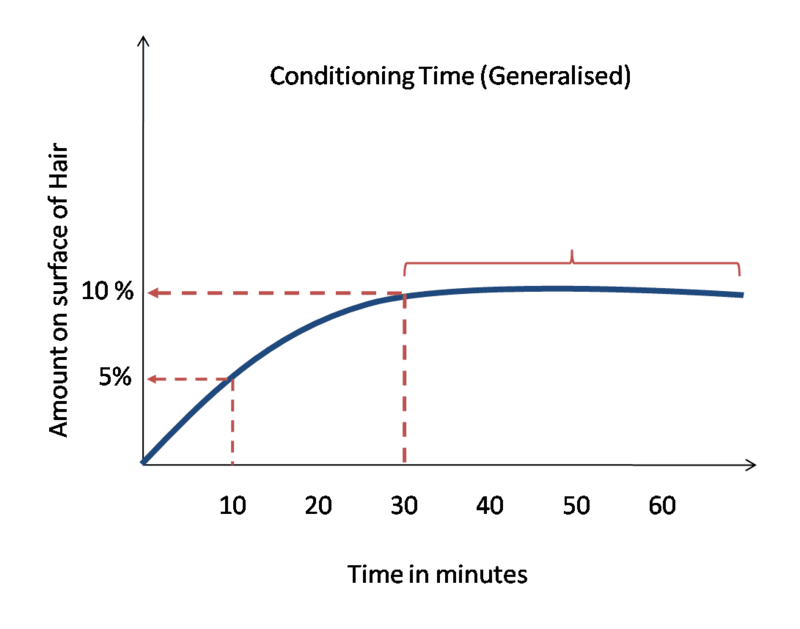 This means when conditioner is heated to 35°C, at 10 minutes there is slightly more than 5% on hair and at 30 minutes there is slightly more than 10%. Therefore temperature increases adsorption. The rule however remains the same in terms of no further conditioner sticking to the surface after 30 minutes. 2. Ingredient Quantities: Conditioners are different and contain different quantities of ingredients. For example, a conditioner which contains 0.2% hydrolysed protein will be able to leave about 20% more protein on the surface of hair compared to one which has 0.1%. The result is more dramatic for surfactants with a 0.2% conditioner able to adsorb 80% more to the surface than a conditioner with 0.1% surfactant. The thing is, manufacturers will not tell you how much is on the jar, so you have to try the product and trust that your hair will tell you whether the product has too much or too little of the ingredient you are looking for. I will put up a summary post next week in combination with your key questions from the series. This is probably one of the more complex posts that I have put up so if you do not understand anything here, feel free to shout! Another extremely educational post in this series. And just as I suspected, multiple hours to overnight conditioning sessions are not required. Good to know. My question is about temperature, what is the best method to raise the temp of my conditioner (especially applied to my ends) to body temperature? The bathroom cabinet where my conditioner is stored can get pretty chilly so I'm sure my conditioner is below even normal room temp at the time of application. It seems using a hood dryer might unnecessarily "over" heat the hair. Thanks again for the great info! You are really good at guessing the upcoming posts! Second time you have got it right! The best way in my view is to warm up your conditioner before you use it. I recommend the water bath method. To do this, take a glass container or a heat resistant plastic container. Put the conditioner you are going to use into it. Never heat up the whole conditioner bottle since you will affect the preservatives. Run your hot water tap until the water is hot, plug the sink and place your container in it (don't overfill the sink, leave enough space to be able to use your fingers to remove the bowl and don't let water get into your container). Give it 5-10 minutes, stir make sure the conditioner feels only warm to the touch, not hot. If it is too hot, leave it to cool, if it is too cold, place it back in the hot water. All you will need to do after that is apply the warm conditioner to your hair and then cover with a plastic cap and follow with a towel to keep in the heat. 35°C is approximately skin surface temperature so maintaining the heat from the conditioner is easily done using your own body. Thank you for this, very informative. Wondering whether heating conditioner -- especially if it has proteins -- compromises it? Does it change it in any way? My English was atrocious in that last reply.......here it is again. You are correct to say proteins can change due to heat (denatured is the science term). This does normally start happening at around 40°C. If you are using something like egg or mayonnaise (meaning real egg or real mayonnaise) then heat is probably best avoided as you can cook the protein and that would be difficult to get rid of. However with nearly all commercial hair conditioners, the proteins used are hydrolysed proteins. These are actually broken up segments of a protein so it is already well beyond denatured. The small segments make it easy to attach and penetrate into hair. 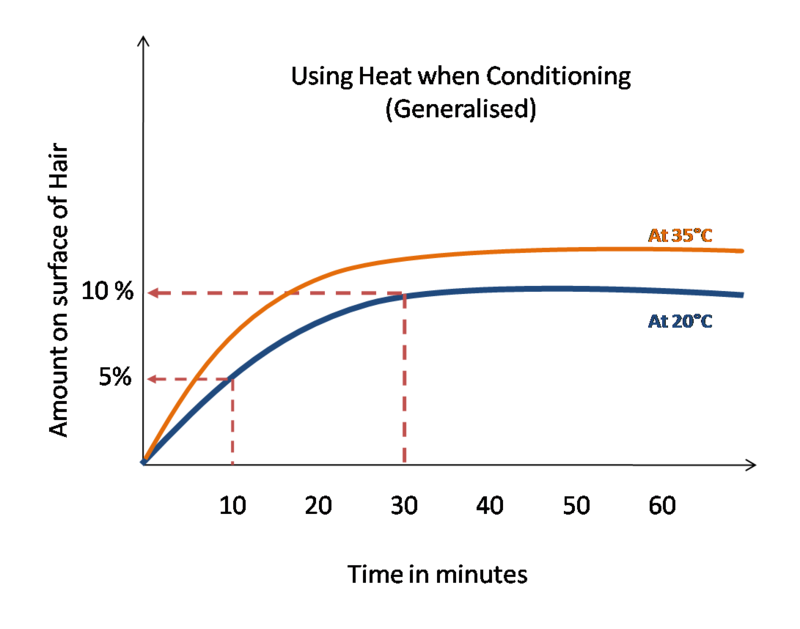 Using heat in general is beneficial for protein conditioning with a commercial product. I knew if I didn't promise to do it yesterday, I would have procrastinated for another week lol. The time for oils is overnight on dry hair (8 hours or more). Increasing temperature would not be a bad idea as the reason why it takes so long is because the oil needs to literally squeeze itself through the spaces in and under the cuticle layers (science term is reptate). In general heat would give the oil more mobility so it would make it easier/faster to reptate.....but that is a theory, not proven. You explain things so clearly! I like imagining the little molecules in my cocount oil finding their way into my hair :). Re: coconut oil, do you think it would be ok to use fractionated coconut oil (long chain fatty acids removed) for pre-poo treatment? My mum would love to use fractionated coconut oil since she isn't keen on the scent of the unrefined oil.... Thank you again for all you do!! Always love the great info that I get from your blog! You got me hooked to the series and am glad you delivered on your promise. It was like sitting on hot coals.Thank you so much!!! What effect does steaming (using a hair steamer) have on adsorption rate? There are no studies on using hair steamers for conditioning.....at least none that I could find. There are studies on using steam to break hair down permanently (called a steam set) where hair is stretched out, steamed for 20 minutes and it maintains the stretch permanently. There are studies on how steam can cause bubble hair. There are no studies on whether steam would improve conditioning. Ugh, not the dreaded bubble hair. :( I'ved used a steamer off and on for two years. My hair seems to be doing well with it, but I wish there were more scientific support to ease my mind. Thanks for responding, JC. Will hydrolyzed protein in the form of gelatin mixed in to the conditioner add protein to the hair if left heated and left on the hair for 30 mins? I'd love to know the scientist's view! I cannot be sure without actually doing an experiment but in theory, yes there would be deposits of protein from the gelatin on the surface of hair and depending on how well hydrolysed it is , it may even penetrate the cortex. So do you think that there is an added benefit to leaving "instant" conditioners (with directions to leave on for 0-5 mins) on for longer (20-30 mins)? My question is about the amount of adsorption in the studies. I get that you chose 5% and 10% arbitrarily, for ease of explaining. But when you say adsorption can be as low as 0.01%, does that mean 0.01% of the total amount of conditioning substance applied? What is the max amount adsorbed in the studies you looked at? This post reminded me of surface complexation theory, adsorption isotherms etc :). It does confirm what I have suspected for a long time. I read one of your earlier conditioning posts where it said that conditioners are designed to do the job within 3-5 minutes. 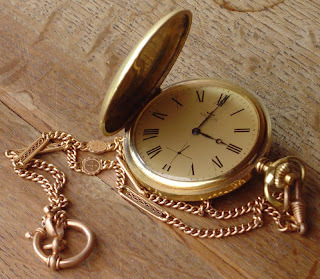 But still I wondered why that amount of time never seemed to work for me, I figured more time may be necessary so more can be adsorbed. I tried the 20-30 minute interval with heat and also tried overnight (without heat). The former worked best and is more convenient! I also use a hot water bath to heat up my coconut oil, esp in winter.I prefer hot oil treatments now because I can leave the oil in, no need to rinse. Works great. I suspect hair steamers may be just as effective as regular dryers. The added advantage is they don't dry the hair out. But at the same time, can sitting too long under a steamer cause damage or hygral fatigue? I get a tingling effect in my scalp from steamers so maybe the warmth also stimulates blood flow to the scalp while opening up the pores, (like a facial steamer)? Thanks Sue. The studies I looked at had really great variance. I cannot quote a maximum amount. For example when comparing amino acids at pH6 from a conditioner, three different amino acids gave three different amounts (arginine ~100mg/g of hair, glycine ~ 20mg/g and glutamic acid ~ 35mg/g). I cannot quote the 100mg/g as a maximum amount because other amino acids have different adsorption rates and will never get to 100mg/g. Additionally if you increase the amount of protein in the conditioner you can increase the adsorption within limits of course. If you are using pure oils, this is different from using a water based conditioner. I would refer to both processes as hair conditioning although one (with water based products) alters the protein in hair due to the long period overnight while the second (oil based) is not known to have this effect. Really love this article!! I have definitely been guilty of over-conditioning and leaving DCs in overnight. But, in the last year, I really started to understand over-conditioning from the context of too much moisture and not enough protein and how it weakens hair. So, I began to try to avoid DCing for more than an hour. This article added another layer of understanding for me!! Great piece!! Great article as usual. I wanted to know one thing : what do you think about the "Huetiful Hair Steamer" . Does it really efficient to use a steamer ? @ JC - I thought I could finally sigh in relief because I thought that my search for a HG DC was finally over due to your first post regarding DC's not being more effective than a regular rinse out conditioner. Now it seems that you are trying to inform us of how to DC properly. The nightmare begins again. I thought that water / coconut oil, olive oil were the only products that could really penetrate the hair. I truly believe that if I was to only use these products and of course, wash my hair once weekly with an organic shampoo, for the rest of my life, my hair would reached its maximum potential. Heck! I believe anyone with natural hair would. What do you think? lol - no nightmares! Water, coconut oil and some small proteins can penetrate hair....these are known. If your intention is to deep condition to allow penetration, these substances should be your target. If you want to deep condition for softness, then adding more time and heat when using a conditioner could be beneficial. The simpler your routine, the better. Do you not use a hair conditioner though in your routine? I have found that the surfactants in them are really useful for smoothing hair. I read that avocado and argan oil can also penetrate the hair strands. Could you clarify? I never wrote that........at least I hope I did not, please let me know if I did because I need to correct it. Coconut oil is known to penetrate (i.e study done and published in journal), avocado butter is thought to penetrate (i.e suggested in a journal based on structure but no actual test done to prove it) and argan oil has not been mentioned in any journal that I have read to penetrate hair.